Be empowered and excited about your finances with proven assistance from DebtGuru. 95% of our clients reduce their interest rates. Many Americans find themselves without extra money after paying their bills at the end of the month. Nearly 40% find themselves with a shortfall each month and borrow or charge the difference on a credit card which deepens their financial pain. In this situation the ugly truth is that all the interest and fees paid to creditors takes away from your savings, entertainment, your retirement or even your child’s education. Facing financial problems can feel threatening and stressful so instead of taking action we often choose to do nothing. It’s easier to push the problem off, borrow a little more and hope for a change. You can stop this today. If you’re honest with yourself and see that this is your current situation, you need to make a different choice, one that attacks the problem, stops it in its tracks and can bring you back to financial security. You may have heard of it already, it is called credit counseling and it has helped literally millions of consumers in financial distress over the years. What you may not know is exactly how free credit counseling services with a debt management plan actually works and what the benefits are for you. 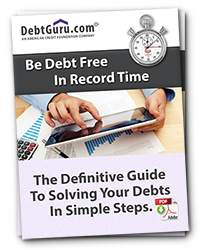 This is exactly what DebtGuru and this website wishes to educate you on. Works WITH your creditors NOT against them? Your creditors agree to give you relief such as interest rate and fee reductions? Your monthly expenses can be significantly reduced WITHOUT a loan? Millions of people have successfully completed a Debt Management program? 95% of our clients reduced their interest payments by nearly $10,000? Getting started to understand your exact options is 100% FREE with no obligation. Learn what a credit counseling program is and how it works. Discover how a debt management program in conjunction with credit counseling creates a realistic plan with powerful benefits to solve your debt issues WITH your creditors approval and permission. It all starts with a FREE evaluation of your finances and advice on your possible solutions. Conducted by certified credit counselors, in less than 15 minutes you can learn exactly how to quickly and confidently turn your finances around. Call us at: 800-259-0601 or Complete a free consultation request above. Debt is a problem millions of people have found themselves in, yet it is also a problem millions have solved by taking advantage of a credit counseling and debt management program. We have helped many thousands of individuals and families just like yours achieve their financial goals one simple step at a time.